The Zoom Tool is used to change the zoom level of your working image. If you only click on the image, the zoom is applied to the whole image. 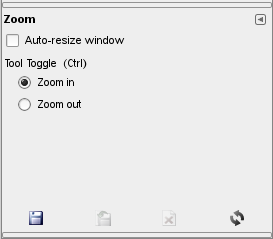 But you can also click-and-drag the mouse pointer to create a zoom rectangle. Then, the action of this rectangle is better understood if the “Allow window resizing” option is unchecked: you can see that the content of this rectangle will be enlarged or reduced so that its biggest dimension fit the corresponding dimension of the image window (if the biggest dimension of the rectangle is width, then it will fit the width of the image window). 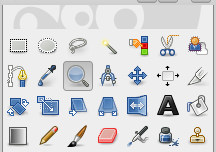 or by clicking the tool icon: in Toolbox. Holding Ctrl when clicking on a point of your image will change the zoom direction from zooming in to zooming out. Spinning the mouse wheel, while pressing Ctrl, varies the zoom level. This option will allow the canvas to be resized if the zoom level dictates it. The two available tool toggles are used for changing the zoom direction between zooming in and zooming out. Using the Zoom tool is not the only way to zoom an image. The Zoom menu provides access to several functions for changing the image magnification level. For example, you can easily choose an exact magnification level from this menu.